Enjoy the striking aviation art of award-winning artist Russell Smith! Lavishly illustrated, the book features 44 full-color paintings and 20 drawings by Russell that bring WW1 aviation to life. 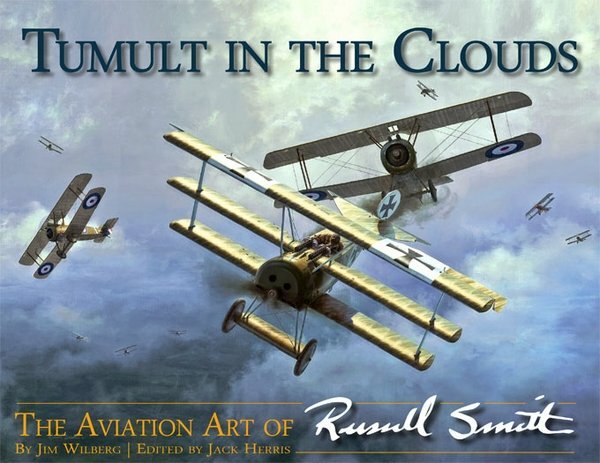 More than a dozen respected WW1 aviation authors contribute to the story with chapters providing the background for the paintings to increase your understanding and appreciation of Russell's exceptional art. Finally, in a well-illustrated chapter, Russell tells you how he creates his art. • Chapters by Javier Arango, Lance Bronnenkant, Dennis Gordon, Jon Guttman, Adrian Hellwig, Jim Miller, Fred Murrin, Colin Owers, Stephen Skinner, Edward Soye, Alan Toelle, Greg VanWyngarden and Charles Woolley. Also available are special remarqued editions. Remarqued editions will include a small drawing created by Russell Smith on an 8.5" x 11" vellum insert. These drawings can be left in the book or can be taken out and framed. Remarqued editons are $99.95. Upon placing your order you may specify what subject you would like or you may leave it up to the artist (please keep it simple - remember, there is only so much that one can fit into a small drawing! ).